My UnExpo Experience: What Motivates Us To Spend Time Testing Something? I have been a secret observer of the Ministry of Testing (MoT) for some time, reading the occasional article and sneaking into The Dojo once in a while for some testing tips. I decided it was about time I got more involved and participated fully in the MoT community. I reached out to the MoT Team for some support to attend their software testing conference, TestBash, and they kindly offered me a TestBash Brighton ticket (via the MoT Scholarship scheme) along with the opportunity to participate in their new experiment, The UnExpo. So, I was in! All I had to do was think up a topic for my UnExpo poster stand. Several days later, I settled on a slightly ambiguous question “What Motivates Us To Spend Time Testing Something?” for my poster. The day finally arrived and I embarked on the journey to Brighton with some trepidation, not really knowing what to expect. I was greeted with a friendly smile at registration and ushered into a room that was buzzing with conversation and super-sized pastries. Before long, the first talk was underway. Two great talks in and it was time to prepare my UnExpo poster. With some frantic poster making during the break, I was ready. Three talks later, it was my UnExpo slot time! And what happened at the Un-Expo? I hear you ask. Lots of conversations with fellow attendees, and lots of interest in my UnExpo stand. Before long, I started to get some answers to my question “What Motivates Us To Spend Time Testing Something?”. My UnExpo poster with TestBash attendee feedback on post-its. ~21% focused on customer quality aspects such as “Increase Confidence” or “Reduce Impacts”. ~21% cited “It’s Fun” as their motive. ~7% wanted to reveal the truth about the product. The remaining 21% of answers were a bit random, forming no further categories. Although a couple did expose their darker side citing “Evilness” and “To Bring Misery To Developer”! 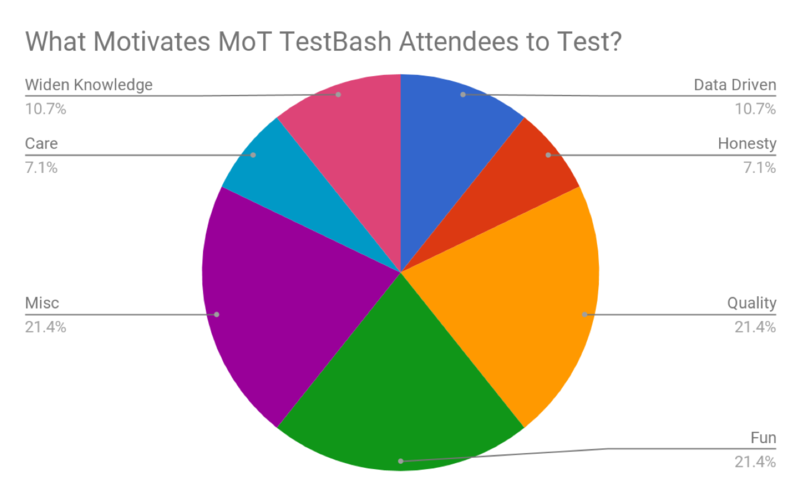 The results suggest that the majority of TestBash attendees are motivated by customer quality whilst having fun when testing. So, I have just experienced my first TestBash. 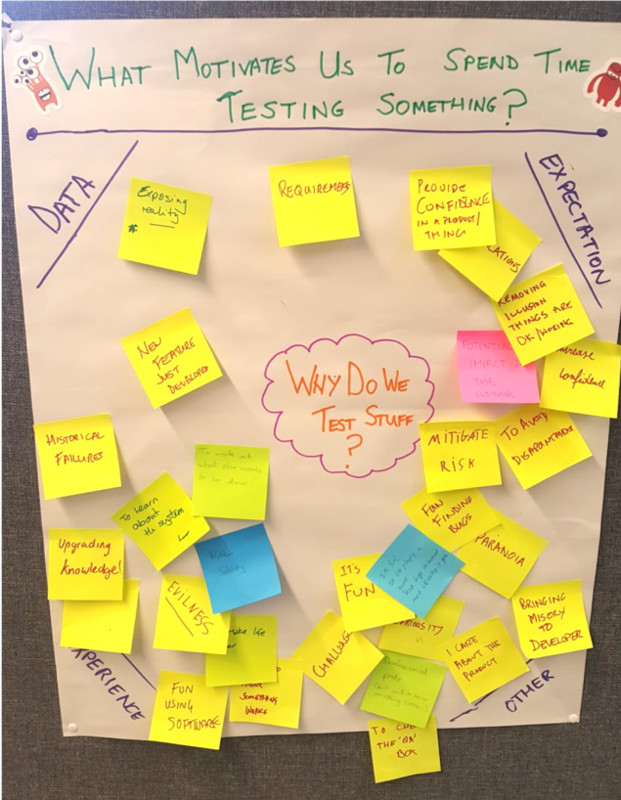 There were some great talks at TestBash Brighton from some inspiring individuals, Communities Of Practice by Emilly Webber and Discovering Logic In Testing by Rosie Hamilton being my particular favourites. It was a truly uplifting day, surrounded by positive, forward-thinking individuals that are really passionate about what they do. And the UnExpo? This added another dimension. It provided a unique opportunity to table a personalised discussion with your peers. The informal, relaxed nature facilitated interactions beyond that of a typical conference environment. I will certainly be there next year! Big thanks to Richard, the MoT team, the Scholarship Heroes (who part-funded my scholarship! ), and all of you who contributed to my poster at The UnExpo. I am an experienced test professional with a passion for technology. My recent years have been dedicated to automated test, sabotaging silos and attempting to discover bugs as close as possible to the point of their conception. I am an Agile convert who has personally experienced teams become truly awesome through scrum.